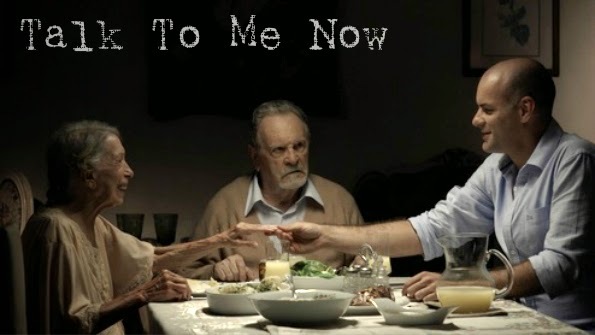 For the first time, Brazilian filmmaker Joaquim Lino has made his 2012 short film Talk To Me Now available for mass consumption with English subtitles! Lino wrote and co-directed (with Karina Ades) this wonderful film about love, family, and compassion in the face of some particularly nasty and brutal sexual intolerance. Julio, a 40 years old man who lives with his father and his grandmother who he helps looking after, works as a cross dressed jazz singer. Julio's father does not approve his work but has to deal with all his anger when his favorite son looses all his money and Julio has to take over all the house's expanses. But the biggest challenge comes to both of them when Julio discovers that his father has a fatal illness. Julio has very little time to destroy the wall between them to win his love and he'll do whatever is necessary to succeed. This barely scratches the surface of the true nature of this charming movie. Julio's brother Manu (short for Emanuel) and Grandmother embrace Julio and respect him and the financial support he gives the family. But, the Father is a different matter altogether. He is a seething ball of hatred and rage who also happens to be dying of an undisclosed terminal condition. In one particularly gut wrenching segment, Julio and Manu are the victims of gay bashing outside a nightclub while at home, their Father is destroying Julio's room and clothing out of disgust for his cross dressing. The acting is so wonderful by the father in this scene that you easily feel his own self-hatred and fear boiling over, causing him to last out. Talk To Me Now is a really well put together short film. Though just 17 minutes long, it really feels like a full length movie. And, the dark and brooding cinematography do a great job of capturing the mood of the soulful, sentimental jazz that Julio sings to make his living. It's more than worth a watch!